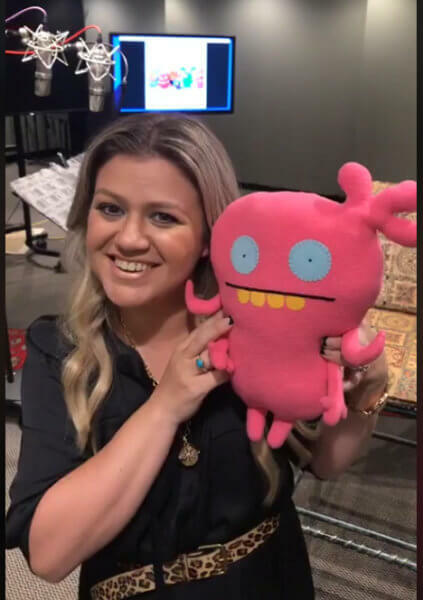 Kelly Clarkson and her ‘UglyDolls’ character, Moxy. Grammy Award winner Kelly Clarkson confirmed via a Facebook video that she’s signed on to voice Moxy in STXfilms’ UglyDolls. Clarkson will also be performing original songs for the film’s soundtrack. “The UglyDolls’ universal message celebrating our differences and individuality really resonates with me, and when STX showed me how incredible UglyDolls will look and feel, I jumped at being part of that world. I can’t wait to start working with the team at STX, the cast and filmmakers,” said Kelly Clarkson. Clarkson joins Grammy Award winner Pitbull who was previously announced as part of the film’s voice cast. STXfilms is targeting a May 10, 2019 theatrical release date, and there’s also an animated kids series in the works at Hulu. “Kelly Clarkson has been a role model to millions of fans since the beginning of her momentous career. We are beyond thrilled that for her next project she chose to do UglyDolls after she saw our character designs, animatics and set pieces, which she loved. We look forward to collaborating with an artist of Kelly’s exceptional talent and versatility,” stated Adam Fogelson, Chairman of STXfilms. Clarkson has sold more than 25 million albums and 36 million singles. Recently, Clarkson’s been keeping busy as a coach on The Voice. She won season 14 of the show which also featured Adam Levine, Blake Shelton, and Alicia Keys as coaches. Clarkson will return to coach season 15 alongside Shelton, Levine, and Jennifer Hudson. Kelly Clarkson previously lent her voice to the animated feature film, The Star, which was released on November 17, 2017. The UglyDolls Plot: In the film, Kelly Clarkson’s character Moxy and her UglyDolls friends confront what it means to be different, struggle with their desire to be loved, and ultimately discover that you don’t have to be perfect to be amazing because who you truly are is what matters most.